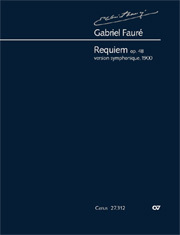 The Requiem of Gabriel Faure is now available in two versions: in the symphonic version of 1901 and in the version with small orchestra of 1889. 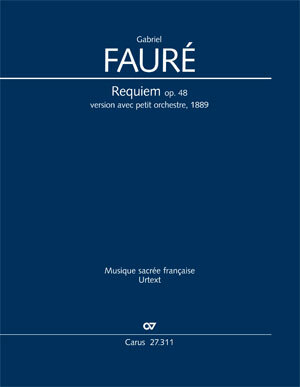 The "symphonic version" of Gabriel Faure's Requiem, published in 1901, was the product of a 13-year compositional process. Starting from the original five-movement form for strings, harp and organ, the composer wrote two additional movements, one after the other, and expanded the instrumentation in various stages for later performances. The present reconstruction of a "version with small orchestra" differs from other such attempts in that for the first time it presents the work not in a mixed version, but rather in the unified form from 1889. This is distinguished from the final version both in musical terms, as well as through the fact that it forgoes the use of flutes, clarinets and bassoons, while employing only two horns instead of four. With a critical Report with information about the source situation and the edition, and containing the individual readings (alternative readings, etc. ).